Everything seems ok while using one of the 10 example stars from the Citizen Sky group. I probably made an error somewhere but where ??? I’ve been using VStar for quite some time now. I’ve been getting the same null point error message lately. Some stars are fine, others won’t load. Ok, thank you for your message Duane, I tried with SS Cyg as well with the same error... Two interesting stars for me today. l will delete Vstar from my tool list. I would never delete VStar from my tool list. It is a very powerful tool and usually works very well. I use it very often. I just don't know what is going on with a few stars. They are ones with a lot of data. I've even used it in a lower level math class that I teach to demonstrate ways of looking at data and the usefulness of "simple" visual data where anyone can contribute. Between the last sentance and this one I loaded a DCEP and used the DCDFT to find the period using just visual data. The period found was within minutes of the published value. This took maybe 2 minutes and could be refined to get even better results. Keep using it and think about the VStar Choice class for VStar. It is a great class. I just loaded khi cyg using dates other than the defualt and it worked fine. There is an older forum post around May 2016 that may have something to do with what is happenning. It concerns loading errors with ss cyg. Maybe Ken or David could chime in? I had trouble this morning using Khi Cygni. I think KHI CYG is what worked with the LCG. I suspect Vstar will only work with the same designation.--Well that did not work either. "Khi Cyg" works in LCG and I would expect it to work on VStar too. Thanks for the detective work, Duane. I'll investigate the data on khi Cyg and for that particular observation report and report what I find. The second observation's uncertainty value is "NAN" (not a number). Looks like LCG is being tolerant of that by ignoring the observation but VStar is not. LCG just shows one observation, ignoring the second. VStar should be modified to handle that. I just remembered I already created a ticket for this (https://sourceforge.net/p/vstar/bugs-and-features/602/) and started addressing it not long before my Mac died (I have backups and committed the code remotely). I've added the Khi Cyg example. The observation should be fixed via WebObs. Thank you very much for determining the 'NAN' content of the uncertainty field for that observation. I have fixed it and the khi Cyg data now load smoothly for me in VStar. Thanks Duane, Gary, Elizabeth for your help and also thanks for your kind words Duane. It's always great to hear about how people are using VStar in different ways. I have limited access to compute resources right now. My Mac's charging port died a few weeks ago. It was several years old and due for replacement anyway. The replacement Mac is several days away (getting a bigger SSD than comes standard) . While doing much debugging right now is hard I'll do what I can by looking at the web service response. If you have other star/date combinations for which you see errors, please post them here. Michel, you can change the locale from French to English in Preferences. VStar is just picking up on what it thinks is the set locale for your opertating system. Does nothing else on your PC appear as French? Let us know here if you need help with this. See also the relevant section in the user manual. Do you see the observation plugin error just when loading data from AAVSO or at other times too. I'm sorry you are having a frustrating time. We are here to help. I get the same nullpionter error with SS CYG. I can load all data except between JD2457972-73. I noticed one of the V observations are by the same observer as the single observation that seems to be responsible for the error with khi cyg. The observation date for ss is 2457972.66807. I have no trouble loading either star in LCG other than the time to load lots of data. WebObs upload should reject NAN in *any* numeric data field - it is never a legitimate value. VStar is certainly not at fault for not coping with this. I have been looking at that SS Cyg observation on 2457972.66807 (and all the SS Cyg observations for 2457972.6+) but I can't see anything wrong with any of the fields. However, something clearly is wrong as VStar will load up to 2457972.6 and from 2457973 on but not in between. It's not VStar, it's the data. I'll keep checking, but unfortunately I have to leave now for the day to go to a meeting. I'm not sure I'm going to be able to work on it over the weekend, but if not, I'll pick it up Monday morning. You can't blame the data if LCG will load it! Clearly, something in VSTAR is causing the problem. Having done a lot of programming that interfaces with end users, you cannot be too thorough with ERROR HANDLING in the code. The "try"..."catch" constuct is a MUST in every line of code that reads user data. At the very least, even if the program hits some crazy input it cannot handle, each statement should have a unique error code dumped to the logfile, to allow tracing exactly where the problem originates from. VStar applies error handling and exception blocks liberally. Sometimes though, things "fall through the cracks"
There are two things you can do with an erroneous observation: ignore it or try to correct it. Not sure what LCG does without looking again. Perhaps someone else knows. If I see invalid (not well-formed) input, my inclination is to ignore the observation but indicate that to the user. I'll admit that that policy is not applied uniformly across all observationn source plugins. Having said all that, it's also been pointed out by at least one other person in this thread that as far as AAVSO submitted data is concerned, the best place to stop errors from making it into the database is WebObs. I found the problem with the SS Cyg data. Some records by observer JM contained a value of "\2" for uncertaintly rather than the intended ".02" and my guess is that VStar didn't like the blackslash (since it is an escape character). I have corrected the observations and SS Cyg now loads correctly again. I agree completely that this sort of thing should be caught by WebObs. Until we can get to that project, I think that probably the best thing for VStar to do is ignore such data issues. Unfortunately, the uncertainty field in our database is a varchar so MySQL itself will not stop strange characters from getting into that field. Seems odd that an uncertainty should be stored as a character type rather than a numeric/decimal/float type? Thanks for looking at all this. As Michael said, it's interesting that the uncertainty field is a varchar but as you said, right now, that's the reality. I have had a fix committed for awhile that will be in the next release. Where is Khi Cyg ? First of all, regarding the Java error, thank you for the correction work in the DB, I will try VStar again in a while. 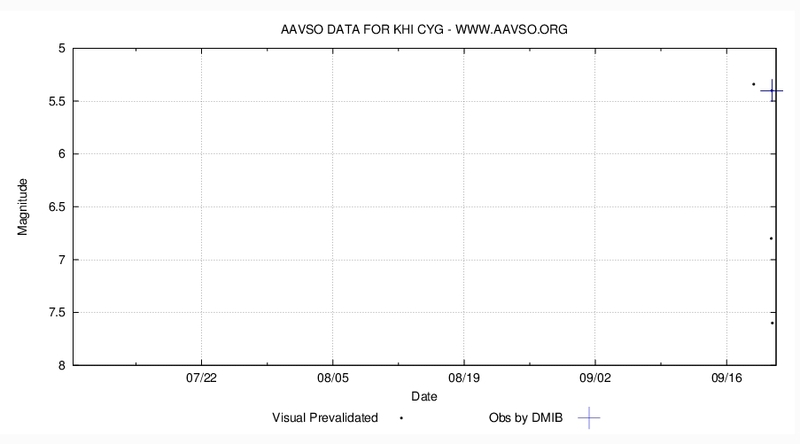 The Khi Cyg data is back. We are doing some maintenence having to do with a VSX cleanup that temporarily kept you from finding that star's data. Nothing was lost and all should be OK now.